When you choose your children’s dentist, you’re choosing much more than a professional that has extensive knowledge on the mouth. You need an adult that cares just as much about the wellbeing of your child as you do. Someone that understands that dental anxiety truly exists, even for our little ones. If your child is apprehensive about visiting a children’s dentist in Castle Pines, we have a variety of sedation services that can make their first few dental appointments more relaxed. Why is it important that your child visits the dentist regularly? Help parents and children understand what causes dental problems and how to avoid them. Encourage parents and children to indulge in a healthy, balanced diet for optimal oral and overall health. Show parents and their kids how to care for their teeth properly at home. Leave a long-lasting impression of positive experiences with their dentist. How can we help your child’s dental appointments run smoothly? 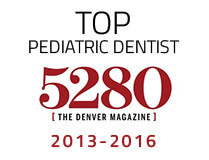 Castle Rock Smiles Pediatric Dentistry strives to provide the happiest place for kid’s dentistry in the Montrose area. Our priority is your child’s comfort and safety. We do our best to make their office visits warm and inviting, but some children still experience dental anxiety. In the instance that your child is unable to relax before their dental appointment, Dr. Lyne Benzley offers safe sedatives proven to be a fantastic option comforting children and reassuring parents. This quick, mild sedative that relaxes children with minor dental phobia. This sedative does not put children to sleep. Your child can hold a full conversation while still having their gas mask on and will quickly recover from the sedation as soon as their dental appointment is over. Although not as pronounced as general anesthesia, oral conscious sedation is a heavier sedative that is administered through a juice mixture with the appropriate amount of medicine. This magical juice will make children feel a little drowsy and usually, children tend to fall asleep for the whole dental visit. After the appointment, your child will probably have a numb mouth but still be alert and responsive as normal. This form of sedation is for children that have severe dental anxiety or extensive dental work that may be considered scary or painful. We want your children to experience pleasant dental visits, so we will bring in a general anesthesiologist to administer the sedative and monitor your child. While your child is asleep, he or she will not be able to feel a thing or have hardly any memory of their dental appointment. They will most likely be sleepy for the rest of the day but return to their normal, active selves soon after. 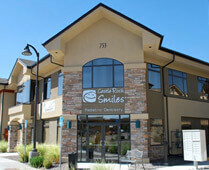 How can I schedule an appointment for my child to visit Castle Rock Smiles? Getting your little one in to see their new dentist is as easy as contacting our friendly office team. We would be happy to schedule a comfortable appointment as soon as you’re available. Call us today!